Cheaper clean-energy technologies could be made possible thanks to a new discovery. Led by Raymond Schaak, a professor ofchemistry at Penn State University, research team members have found that an important chemical reaction that generates hydrogen from water is effectively triggered — or catalyzed — by a nanoparticle composed of nickel and phosphorus, two inexpensive elements that are abundant on Earth. The results of the research will be published in theJournal of the American Chemical Society. 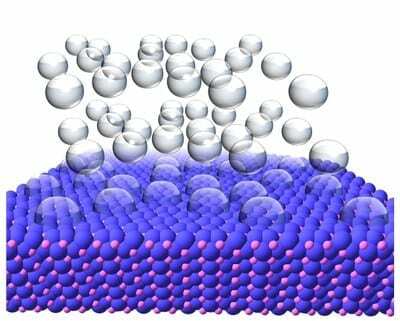 Schaak explained that the purpose of the nickel phosphide nanoparticle is to help produce hydrogen from water, which is a process that is important for many energy-production technologies, including fuel cells and solar cells. “Water is an ideal fuel, because it is cheap and abundant, but we need to be able to extract hydrogen from it,” Schaak said. Hydrogen has a high energy density and is a great energy carrier, Schaak explained, but it requires energy to produce.